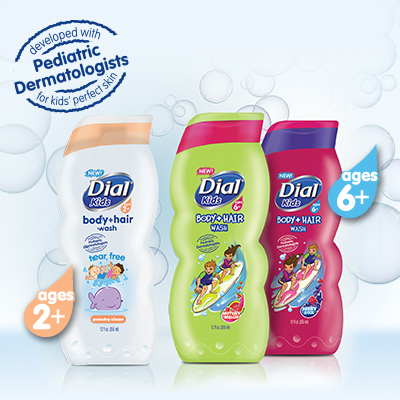 ♥ Mama 2 Multiples ♥: Dial Kids Body and Hair Wash Review & Giveaway! With little ones, having a good quality, yummy smelling shampoo/body wash is essential! I swear by Johnson & Johnson products when my babies are little, but once they reach toddler age, I start checking other brands and products out and have yet to find a favorite on the market today. That was, until I got the chance to review NEW Dial Kids Body and Hair Wash! "Meant for children aged 2-5, this body wash is perfect for kids that have outgrown traditional newborn soaps, yet are not ready for adult strength body and hair wash. The Peachy Clean variant provides ultra gentle cleansing with a fun, light scent!" I LOVED the smell of this hair ad body wash as soon as I popped the top to take a sniff. We got right down to business and tried this new kids' body wash for the first time that evening! First to give it a shot was Mason! I know it's hard to see in these photos because he wouldn't sit still, but the first thing I noticed about this kids' soap was how well it lathered up immediately. I LOVE a good lather, and that way, I KNOW my kids are getting nice, fresh, and clean when there's a strong lather from the soap. It cleans very, very well too, and leaves all of my children looking squeaky, polished clean and dirt and grime free! Connor and Merasia loved it as well, and it doesn't bother their eyes IF a little does slip into them because, of course, it's tear free! Look at those happy, clean faces! All in all, we were very, very satisfied with this amazing nourishing body wash, and I can safely (and finally!) say I have found my new favorite bath product for my children! WIN IT: THREE lucky readers of Mama 2 Multiples are going to WIN a FREE bottle of Dial Kids Body and Hair Wash of their own! To enter, simply fill out the form below and follow all instructions! Good luck!